Record-setting fuel efficiency and a proven record of performance and productivity. All Model Year 2019 Steiger tractors will include a three-year, 2,000-hour factory warranty. Choose from 42 configurations from Quadtrac ™, Rowtrac™ wheeled, and scraper options to best fit your operation or line of business. 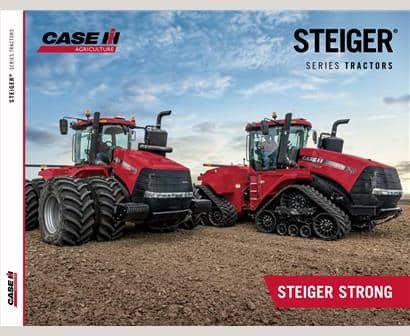 All Model Year 2019 Steiger Rowtrac tractors will be fit with track options that allow a maximum travel speed of up to 25 mph for all track widths: 18, 21, 24 and 30 inches. Four points of ground contact deliver more power to the ground with less compaction. This proven design provides a balanced and continuous footprint for maximum traction. Steiger tractors are proven workhorses on construction sites, moving earth at the lowest possible cost per yard. Five models—with wheeled and track options— allow you to match tractor power to your scraper system, whether carry-all or ejector, single, or tandem. Comfort is a priority when you spend long days in the field, and Case IH delivers, thanks to input from our customers. The Steiger Surveyor® cab is the largest, most comfortable cab in the industry on a row crop chassis. And it’s so quiet, you can talk on your phone or multitask as needed to run your business. With 68 sq. ft. of glass and a 40-degree, right-hand swivel seat in the cab, Case IH Steiger tractors give you an exclusive 360-degree full field of vision. Forward visibility is optimized by the Steiger’s sloped hood, and rearward visibility provides an unobstructed view to the drawbar. Our exclusive 4-Point Cab Suspension with shock-absorbing components at each corner of the cab stabilizes front-to-back, side-to-side and up-and-down motions, giving you a smooth ride regardless of terrain. With reduced jarring and bouncing, you’ll have greater focus on the job and more control over your tractor without fatigue and soreness at the end of a long day. Adjust your speed, gears and direction, and much more without even raising your elbow. The Case IH MultiFunction control handle puts 85% of the controls operators use most at your fingertips. Guided by customer input, the MultiFunction handles features new raised, backlit buttons. You can tell them apart by touch alone, making it even simpler to switch between functions. Long days in the cab demand seating that’s still comfortable after 10, 12 or even more hours. The Surveyor® Cab delivers with a three-position ride control seat, which features an adjustable backrest and lumbar support. The heating and cooling option — with slide-out cushion for leg support — is ideal for working in seasonal temperature extremes. When you have to do nighttime field work, nothing is more important than good lighting. Our new optional LED lighting packages improve visibility during nighttime operation, helping you work more efficiently and reducing operator fatigue and stress. 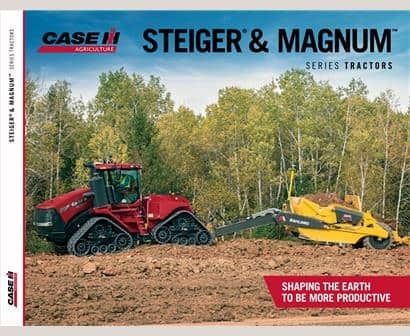 Steiger tractors now operate more like Magnum tractors with an automatic differential lock, which pulls you through tough spots and reduces in-field compaction. The standard feature automatically engages and disengages, ensuring ease of use. It can also be manually overridden, giving you more more control over your tractor. The Case IH Advanced Steering system, which requires less effort to turn the wheel, now comes standard on all Steiger models. It gives you smooth and precise control of the tractor and implement at all speeds and makes transitioning easier from field to road and road to field. And unlike previous systems that required 4 full turns side to side in field applications, the new system requires only 3.5. The Steiger Series Tractor hydraulic system uses the latest technology to provide an efficient, productive, user-friendly system. With 113 gallons per minute flowing through up to eight hydraulic remote valves, that’s enough hydraulic flow for even the biggest planters and air seeders in the industry. And it doesn't require a separate system or pump, meaning it's easier to monitor and more reliable. Because no two jobs are the same, you need to rely on the ability to change things up on the fly. Good thing the three-point hitch lift capacity increases to 20,000 lbs. on Row Crop frame models, allowing for more versatility to handle just about any load. With four different hitches to choose from: standard drawbar, heavy duty drawbar, Class 5 yoke drawbar and Scraper drawbar, obstacles at work are no longer insurmountable. Providing you the power to plow, dig, haul and tract through anything with ease, no matter the conditions or usage. Steiger tractors feature massive, heavy-duty axles that can carry up to 66,000 pounds of operating weight. That’s the most weight any tractor of its class can handle, making it easier to cover more acres in a day and keeping the job on track. These enormous axles also feature unparalleled braking and hydraulic pressure, as well as lubricated and cooled wet internal brakes. The brakes have been redesigned to offer increased operating pressure for feel and modulation. This equates to built-in strength and durability for lower cost of operation and increased resale value. From moving silage to moving snow and working with the largest implements around, there’s a Steiger configuration built for every job. The Steiger Rowtrac undercarriage is unique in its design, utilizing a narrow belt that allows you to get between rows in the field like a surgeon. The design also provides for more stability, featuring a vertical suspension system that uses rubber “donuts” that act like shock absorbers, keeping the suspension from shifting side to side and securing the tracks on the row for even more reliability. 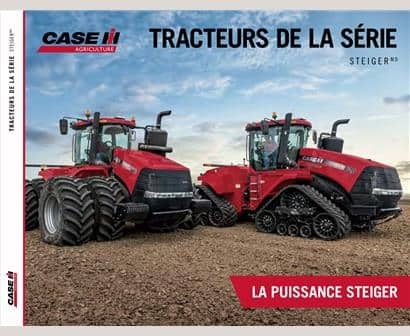 The undercarriage is maintenance-free, with on-the-go track self-tensioning and clear bearing caps for easily checking fluid levels, creating a hassle-free experience and making the Steiger Rowtrac undercarriage one that’s designed to work. Built directly into your Case IH equipment, AFS components deliver intuitive precision farming solutions that reduce waste and increase overall efficiency all year round. From managing inputs during field preparation, planting and growing, to monitoring yield and moisture at harvest, AFS helps you uncover opportunities that turn potential into profit. With single or dual options, the AFS Pro 700 display allows you to seamlessly monitor and control key machine functions across all Case IH equipment. The 10-inch screen is easy-to-read in daylight and adjusts for night visibility. It is fully customizable, with up to six run screens. Plus, it features ISO11783-compliant instrumentation that works with equipment from other manufacturers. Steiger tractors offer the industry’s first full autoguidance system in reverse for articulated 4WD tractors, perfect for irregular-shaped fields and point rows. Easy-to-use AFS AccuGuide with Advanced Line Acquisition ensures that each row is identical, eliminating the guesswork of row spacing. That means fewer end-of-row turns and overlaps. And the new AccuTurn feature enables hands-free, end-of-row turning to maximize efficiency and productivity. The system also controls traffic patterns and decreases compaction for overlapping passes -- benefits that bring higher yields. AFS software pulls together numerous sources of data about your farm and gives you the information you need to stay abreast of how things are changing. You own the information, so you decide how to use it. Adapt charts, graphs and layered maps for further analysis of variety / hybrid, plant populations and soil topographies. Or create boundaries, autoguidance lines, and compare farming practices and field-to-field yields from year to year. We’ve improved the way a Steiger tractor engages to a guidance line. ALA not only gets the tractor to the line quicker, but it also reduces overshoot. When planting or seeding, ALA will help you reduce overlap and the amount of missed areas on headland turns. With such precision, your overall farm efficiency will improve. 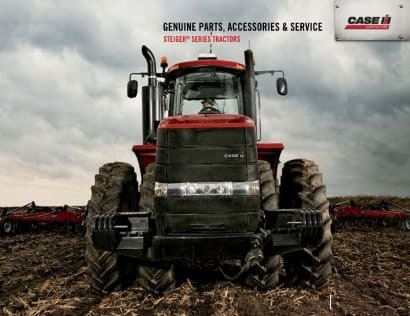 From the frame construction to the heavy-duty powertrain, Case IH Steiger tractors are built for maximum uptime. Easy maintenance with ground level access to engine, transmission, hydraulic and axle fluids. The Case IH Quadtrac design is maintenance free, with clear caps, self-tensioning track, no grease zerks and debris ejection in mind. Industry-leading oil service change intervals help keep you in the field longer. Brakes absorb more heat so they last longer and in more extreme conditions. The Steiger® 580, featuring a 12.9 L Tier 4 B/Final engine, is a heavy duty, high horsepower tractor providing the power and fuel efficiency you need. Available configurations: HD Wheeled, Quadtrac®, HD Wheeled Scraper and Quadtrac® Scraper. Whether tilling, planting, seeding or fertilizing, discover how the industry-leading performance and power of Steiger® tractors can benefit your operation year-round. Room for a Steiger® in Jay Leno’s Garage? You Bet!